You can arrange this from 24 down to 1 (a countdown) or from 1 up to Christmas. 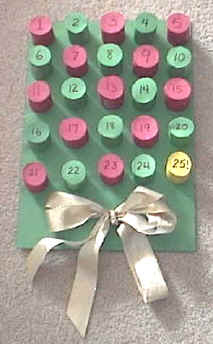 I always do it from 1 to Christmas as it encourages the kids to count the days that are remaining until Christmas -- it never hurts to sneak in a bit of counting practice *grin*. Let the kids break into one of the cups each day until Christmas. Cut 13 toilet paper rolls in half. Paint the toilet paper rolls or cover them with construction paper. Cut circles out of construction paper (just trace around one of the largest toilet paper roll ends to get the size of the circle). You can fold the paper in half a few times so you get more than one circle at a time. Glue a circle onto one end of each tp roll half. Drop a small candy into each little tp roll cup that you've created. Glue a circle onto the top of each tp roll half. Use a black marker to write the numbers 1 thru 25 onto the closed tp roll cups. Tape two pieces of construction paper together to make one large sheet (or use a piece of poster board). Arrange the cups in whatever way you wish and glue them onto the poster board (we just made a rectangle, but you could arrange them into a Christmas tree shape, a candy cane shape or a wreath shape). Add a bow if desired.